We collect, process and use your personal information in order to provide the services requested by you, in particular to process your requests and donations and to communicate with you in relation to the above listed purposes. The refusal to provide personal information for the aforementioned purposes could affect our ability to fulfill contractual obligations or provide the services, information and / or materials requested by the user. With your consent, we may also use your personal information in order to provide you with advertising and promotional material relating to us or other third parties using automated means (such as e-mail or fax. ), As well as paper mail and the operator – assisted telephone calls. 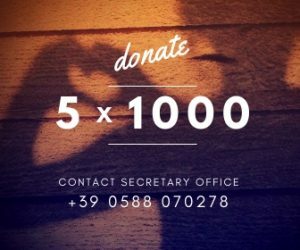 If you decide to register with us or make a donation to this site, we will collect personal information about you, such as your name, email and mailing address, telephone number, credit card information, which you voluntarily share with us. We process personal information mainly through electronic and automatic means. Personal information can also be processed in paper form. We collect personal information necessary to enable us to offer you the services offered on our site. When you browse through our site, such information may be provided to suppliers or third parties involved to fulfill your requirements, subject to the conditions described in the section “Sharing and transferring personal information” below. For the purposes described above, we may transfer and share your information, in accordance with applicable data privacy laws and based on knowledge needs, with third parties including contractors, agents or data processors, some of which may be outside your national jurisdiction, to allow these parties to provide services and improve our service offerings. We will establish the appropriate contractual terms or other protections to adequately safeguard such data. The Personal Information you provide will be transferred and stored in a jurisdiction that may not provide an adequate level of protection to Personal Information equivalent to that provided by your home jurisdiction. We have engaged as our data processor the a service provider with a european GDPR certification: Aruba SpA – Via San Clemente, 53 – 24036 Ponte San Pietro (BG), IT – Policy Privacy of Aruba SpA. In addition to the circumstances described above, Fondazione Volterra Ricerche Onlus may disclose information you have provided if required to do so by law, court order, as requested by any government or law enforcement authority, or in the good faith belief that disclosure is otherwise necessary or advisable including, without limitation, to protect the rights or properties of Fondazione Volterra Ricerche Onlus when we have reason to believe that disclosing the information is necessary to identify, contact or bring legal action against someone who may be causing interference with our rights or properties, whether intentionally or otherwise, or when anyone else could be harmed by such activities. Information gathered through usage of a cookie is not linked to any direct personal identifiers (e.g., your name or e-mail address), unless you register with the site or make a donation via the site. Once you submit personal data on our sites (e.g., by registering or making a donation) we may link such personal data with cookies or other data that are associated with your visit(s) to our sites. Before we do so, we will notify you of this fact and seek your consent or grant you a right to object, if required by the law. We may change this policy from time to time. If we decide to change this policy in a material way (for example, a change regarding disclosure of Personal Information), we will post notice of the change on our site. Your continued use of our site after we make changes to this policy is deemed acceptance of those changes. If any proposed change is unacceptable to you, you may request to that we remove your Personal Information (and/or that of other individuals for whom you made your donotaions) from our records.